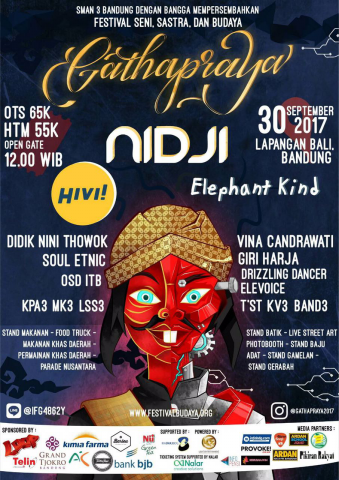 Festival of Art, Literature, and Culture "GATHAPRAYA"
Last Saturday, 30 September 2017, students in 3 High School Bandung held an annually event Festival of Art, Literature, and Culture named Gathapraya. Gathapraya is different from another 'pensi' because this festival is held to foster love of traditional arts and culture to the community across generations. Gathapraya is a festival to remind that the art of culture is the ownership that is the joint responsibility to maintain, preserve, and develop it. At morning before went to the Bali field, all 10 grade members, teachers, and committees of Gathpraya was in Saparua to did a Parade before the official opening of Gathpraya. Each class wore the different clothes of different provinces. Before a Parade got started, there were dance performance and horse gymnastics by children in Saparua. Then, we started a Parade from Saparua to Bali Field. After arrived to Bali Field, 2 people each class dressed custom clothing are performed on stage to did fashion show. Assessment did during the parade and when they performed. Governor of West Java, Ahmad Heryawan came to Gathapraya to saw local custom fashion show. He reminded us of the importance of local culture in this country. Because Indonesia had various kinds of culture that exists. Then, the winner of fashion show announced and the winner was science 6 grade 10. In Gathapraya, there were many stands like Batik stand, Gamelan stand, Traditional Dress stand, and Pottery stand. There was a photo booth too so we can share photos and upload it in social media. Live street art made by 3 school student. There were many food stands and food truck which served regional specialties and another food to made us full. Gathapraya enlivened by many sponsors. The ticket price OTS was 65k, quite expensive but worth it. 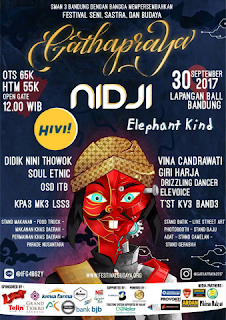 Didn't forget that in Gathapraya, there were several appearances of extracurricular 3 High School Bandung like KPA3, MK3, T'ST3, KV3, LSS3, and BAND3. There were another extraordinary performance like OSD ITB, Soul Etnic, Elevoice, Drizzling Dancer and Giri Harja. After close gate before appearance of the guest star, there was an unique appearance of the sand-painter, Vina Candrawati who at the time she described the culture of Indonesia. Long enough duration given but the performance of her paintings were rarely watched by those young people include me in there managed to make us all amazed. Not only that, Didik Hadiprayitno as known as Didik Nini Thowok came to show his dance to everyone in there. Didik Nini Thowok was an artist with on dance art. He was famous for his 'two face' dance, which it was a dance that runs two facial character at once by using the front rear mask. After the sand painter and dance art, switched to the guest star. First up the stage there is Elephant Kind who was ready to enliven the night. Those who turned the stream into urban pop was fresher and westernized. But I just kept quite and looked at them while cheering because I didn't know that all the songs they sang. When Elephant Kind finished and got off the stage, It turned out that under the stage there were personnel Hivi! who already to exterminate everyone in there. There were Ilham(vocal), Nadhia Aleida or often called Neida(vocal), Ezra and Febri (Guitar). Costumed with matching color maroon greatly enhanced our spirit to sing hitz such as 'Sama-Sama Tahu', 'Kereta Kencan', 'Orang Ketiga', 'Pelangi', 'Siapkah Kau Tuk Jatuh Cinta Lagi'. Fortunately I knew very well all the songs. It rained after Hivi! finished the stage. Dropped by the rain fell when the last guest start performed. Yup! Nidji presents the song with a disco wobble. The songs he brought like 'Biarlah', 'Arti Sahabat', 'Biarlah Aku', 'Laskar Pelangi' made the fire spirit in everyone in stage smoldering. Nidji closed the night on that day with a lot of sweat. That night was tiring for me but it was memorable!